In a small bowl, add garlic powder, smoked paprika, ground cumin, honey, and olive oil. Rub the season blend on the flesh side of the salmon. Place on baking sheet skin side down. Bake for 15-18 minutes, until the flesh flakes off with a fork. In a small bowl, add avocado, cilantro, red wine vinegar, lime juice, red pepper flakes, garlic clove, and salt to taste. 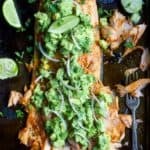 Top the salmon with with avocado salsa and garnish with red onion. Serve!